Get on the Bay Bridge towards San Francisco. Take the Fifth Street Exit. Take a sharp left hand turn onto Fifth Street. Go two blocks to Brannan Street, turn right on Brannan. Go one Block to Sixth Street, turn right on Sixth. The parking entrance to the Flower Market is on the right side just past the Flower Market Café. Take 101 South to the Golden Gate Bridge, cross the Golden Gate and follow the signs toward Lombard Street. Follow Lombard Street till you get to Van Ness. Turn right on Van Ness. Go down Van Ness 1.1 miles till you come to O’Farrell, turn left on O’Farrell. Follow O’Farrell 0.6 miles to Mason Street, turn right on Mason. Follow Mason two blocks to Eddy Street, turn left. Go one block to Cyril Magnin North, Turn right. Cyril Magnin becomes Fifth Street when you cross market. 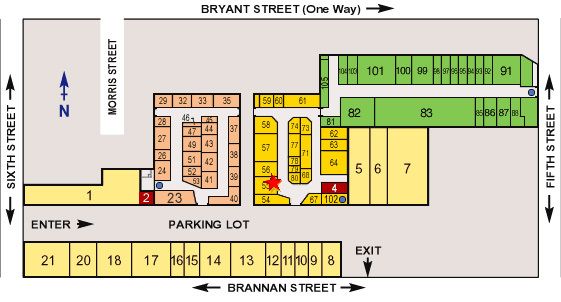 Go down Fifth Street 6 blocks till you come to Brannan Street. Turn right on Brannan. Take 101 North towards San Francisco. Merge onto 280 North toward PORT OF SF. Take the Sixth Street exit. Take 280 North towards San Francisco.